Aluminium rolling shutters, available in roll formed - foam filled lath for low/medium risk applications, and single or double skinned extruded lath for higher risk areas. Foam filled lath shutters are available in a few colours, the extruded lath single or double skinned, can be powder coat paint finished to any standard BS or RAL colour. Operation by manual push up (spring & lock), gear operation via rod / crank or electric operation with single phase tubular motors, with rocker or key switch. Suitable for anything from Domestic windows and doors, Shopfronts, Garage Doors, Bars, Kitchen Serverys, Receptions and Commercial applications. 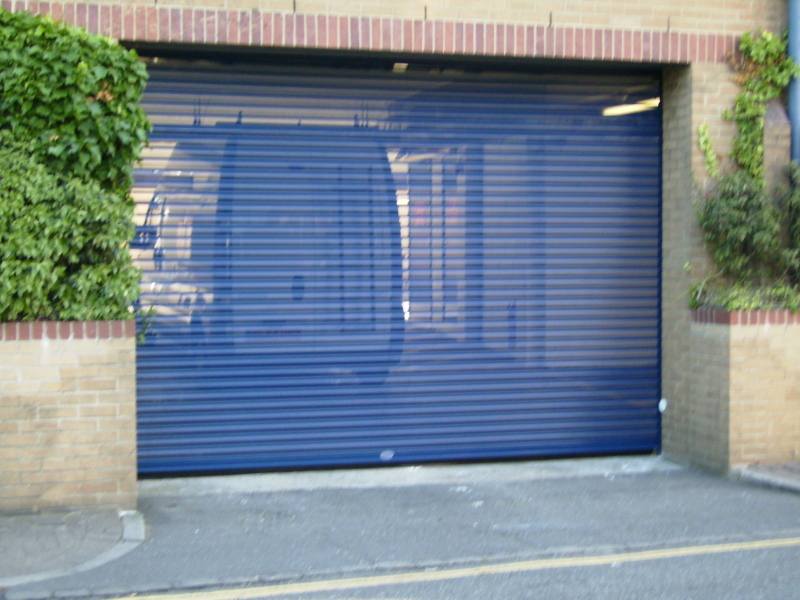 Adalons can offer a range of rolling shutters combining both security with vision. The aluminium slats are punched, with choice of pattern design either brick bond or in line,these shutters ideal for smaller shop fronts, kiosks, bars and commercially, where vision is necessary. With a range of different aluminium profiles to choose from, all allowing light and air through the punched slots, and still retaining a high level of security. Punched lath shutters also have the option to have clear polycarbonate lexan strips inserted behind the slots, offering both protection from either the weather and ingress of foreign objects, whilst maintaining maximum security. All shutters are made to customer requirements and polyester powder coat paint finished to a standard BS or RAL colour. 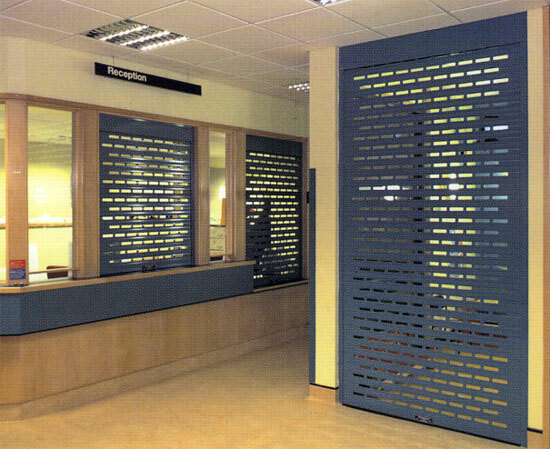 Perforated shutters are available in either aluminium, or galvanised steel usually for the larger installations, this version offers a high degree of vision and security. Operation by manual push up (spring & lock), gear operation via rod / crank or electric operation with single phase tubular motors, with rocker or key switch,all depending on size and application. The steel perforated shutter is available with either manual or electric operation. The manual push up option is provided with either key operated bottom rail lock or pin locks to side guides, made to customer requirements and polyester powder coat paint finished to a standard BS or RAL colour. Ideal for Car Parks, Shopfronts and Shopping Malls. 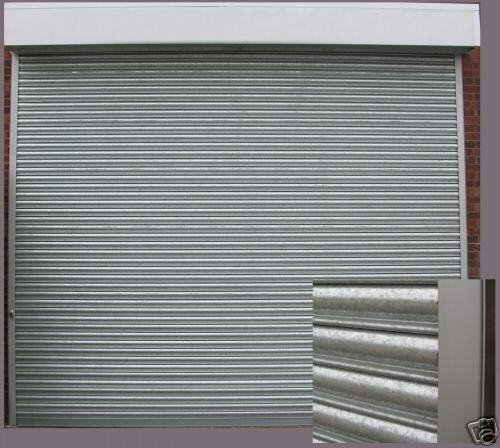 These shutters are general purpose, to suit industrial, commercial and public sectors. Manufactured from interlocking solid or perforated steel laths to suit a wide range of applications, and can be either manually or electrically operated. Manual shutters can be locked by key operated bottom rail lock or by pin locks welded to each side of the guide channels. Electric operation can either be by key switch, remote control or internal push button, and the shutters can be supplied complete with a hood and fascia as required. These shutters are built to last, but periodic maintenance programme will ensure a longer life and trouble free operation. 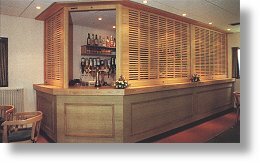 Timber lath rolling shutters are designed for a range of applications including reception counters, bars, display areas, serveries and storage cupboards. Operation is either by manual push up with spring and lock, or by single phase tubular motor activated by or rocker switch or key switch. Electric operation is advised for shutters 2500mm wide or over, motor can include optional rod / crank manual overide facility. 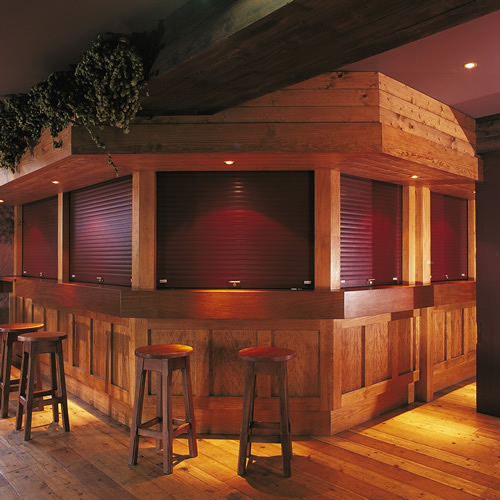 Timber shutters can be supplied in a range of stains and finishes such as beech, ash, cherry, white oak, maple, colombian pine, ramin, red oak, utile and yellow pine, in a choice of styles and two different lath sizes.Optional finishes include sanded(ready for finishing "by others"), polished clear or polished stained finish. Shutters for shopfronts are available in steel (Galvanised), solid or perforated lath, optional polyester powder coat paint finished in a standard BS or European standard RAL colour or a plastisol finish. Aso available in aluminium, solid or perforated shutter lath, punched and glazed with polycarbonate inserts, or a combination of solid shutter and grille. Operation manual push up with spring and lock, or by single phase electric tubular motor, with manual overide,external key switch,or internal push button operation. As with all shutters, built to last, but periodic maintenance will ensure a longer life and trouble free operation.